So, since the entire house is under construction, we thought it was a WONDERFUL time to tear out the yard too. Well, not really, but since the inside is now being cared for by the carpenter, drywaller, painter, plumber, etc., we needed a new project to work on. And come to find out, just like the interior of the house, the yard was a disaster and hadn't been properly cared for in a quite some time. Since we purchased the home in the fall, we had no idea what we'd uncover in the spring. And the "lawn", and I use that word loosely, was actually a combination of moss, weeds and a plethora of layers & layers of old wood chips. Joy. We are quite thankful my father works in landscaping, so he got us on the right track by helping us to tear out all the overgrown bushes last fall, and then cutting down the scrub trees earlier this spring. Greg borrowed a machine from my step-dad a couple of weekends ago, and after killing everything with Round-Up, he got to work tilling it all up to prepare it for top soil & grass seed. Above you see our front yard. You will note that it is very shady, and know that is why we had so much moss. Our neighbors have the same trees as we do, so we are hoping our grass looks as good as theirs does soon! We plan on replanting those hostas in the planters along the shady side of the house. Right now, we're not in the position to be buying a bunch of plants, but we'd like to re-use what is currently in the grown in different areas. I'm sure the yard will evolve over time, but for now, we're keeping it quite simple with grass and the giant trees that are already here! We currently have a HUGE Sycamore tree in our backyard, which provides so much shade in the summer, we hated to leave it. 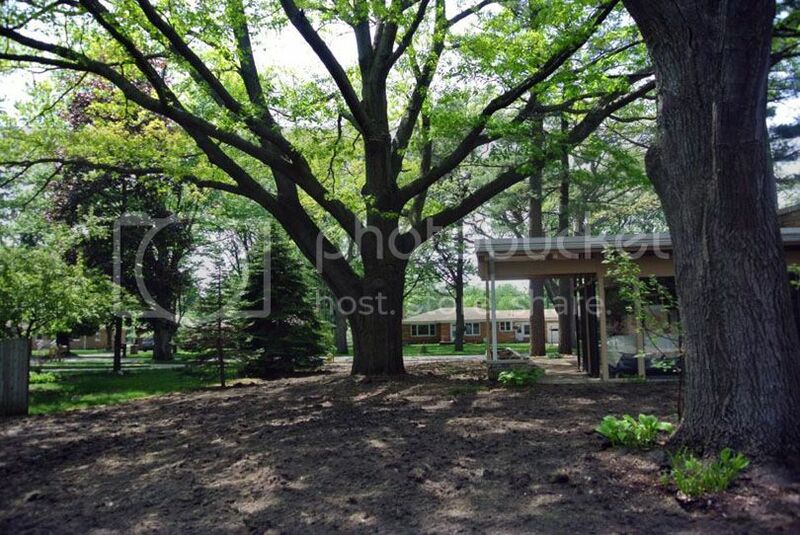 One of the bonuses of this house is the enormous Oak tree on the south side of the home. It's incredible and provides so much shade; it's absolutely lovely. I personally grew up in a home which my parents built on old farmland. We had NO trees in our backyard and I remember hating how darn hot it was all summer long. I'm hoping this tree, along with the others, encourage us to play outside, even in the hot summer months. If you've been reading along, you know this is one of my favorite outdoor spots I'm looking forward to using. It's the outdoor dining patio, and while it's a mess right now, imagine it with the planter the width of the house full of different hostas, a cleaned up patio, our IKEA patio table that seats TEN, along with the Target "Bryant" chairs we decided on. And, of course, numerous planters filled to the brim with colorful annuals. Plus, a perfectly set patio table for family & friend gatherings. Did you know I plan parties for a living? Yep, I cannot wait to host our first party here! 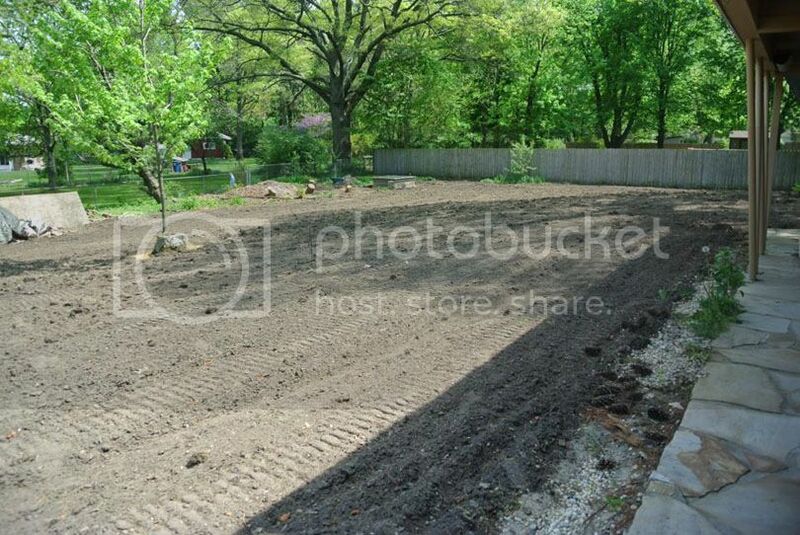 And here is the backyard, all ready for new topsoil and some grass seed. You may be able to spot a few stumps that need to come out along the fence line. And we'd LOVE to continue the privacy fence, but that's one of those projects on the future to-do list I chatted about last week. Back here, we are envisioning nice grass, and possibly a play area for Eames. He LOVES slides and swings, and we'd love to have a play center built for him back here eventually. Again, maybe down the line. Another couple of views of the back. Our poor little palm tree, in the right photo, died this winter. So sad! You would not believe all the random plants we pulled out of this area. I think the former owners just stuck things in the ground haphazardly. It was pretty crazy! And you would not believe how surprised we were when we pulled up the other day to see these glorious, dark purple lilacs in full bloom! Holy crap, I could smell them when I got outta the car. They are on our property line to the north, and actually provide some privacy from our neighbors (although these neighbors sit on a wide acre lot, so their home is pretty far from us). We were planning on doing a privacy fence here (to contain the dog & kid), but we're not sure we need to with this. This area will also serve as our veggie garden next year. Greg plans to work on building some raised planters to contain the veggies, but this will be a project for next year indeed.